The six themes of global significance create a transdisciplinary framework that allows students to think and explore beyond the confines of learning within subject areas. The programme offers a balance between learning about or through the subject areas, and learning beyond them. 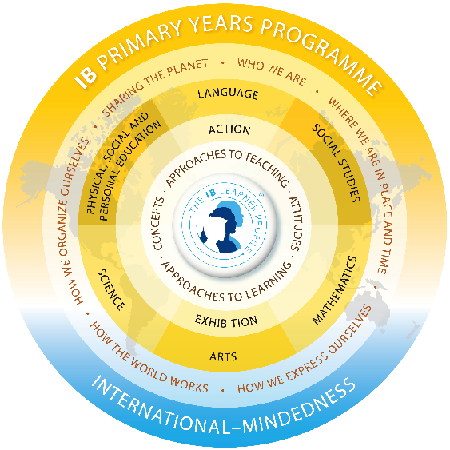 The traditional disciplines retain a role in the IB Primary Years Programme. The six specified subjects are language, mathematics, science, social studies, arts, and personal, social and physical education. Students inquire into, and learn about, the globally significant issues of the transdisciplinary themes in the context of the units of inquiry, each of which addresses a central idea relevant to a particular transdisciplinary theme. These units collectively constitute the school’s programme of inquiry. Assessment is an important part of each unit of inquiry as it both enhances learning and provides opportunities for students to reflect on what they know, understand and can do. The teacher's feedback to the students provides the guidance, the tools and the incentive for them to become more competent, more skillful and better at understanding how to learn. Students and parents will develop an understanding of the IB learner profile https://www.ibo.org/pyp/curriculum/profile/. The ten aspirational qualities of the learner profile inspire and motivate the work of teachers, students and schools, providing a statement of the aims and values of the IB and a definition of what the IB means by "international-mindedness". IB learners strive to be inquirers, thinkers, communicators, risk-takers, knowledgeable, principled, open-minded, caring, balanced and reflective. In the final year of the PYP, students participate in a transdisciplinary inquiry project, the PYP exhibition. It is a culminating experience marking the transition from the PYP to the Middle Years Programme (MYP). The IB Primary Years Programme prepares students to be active participants in a lifelong journey of learning. At the heart of the programme's philosophy is a commitment to structured, purposeful inquiry as the leading vehicle for learning. This is a challenging programme that demands the best from both motivated students and teachers. For further information contact marja.popov@tik.edu.ee. At Tallinn English College, the focus is on student’s intellectual, personal and social development. We offer a comprehensive, inquiry-based and student-centred approach to teaching and learning. We promote high academic standards but also develop various skills and positive attitudes towards learning. We place an emphasis on the ideas of international understanding and responsible and active citizenship.